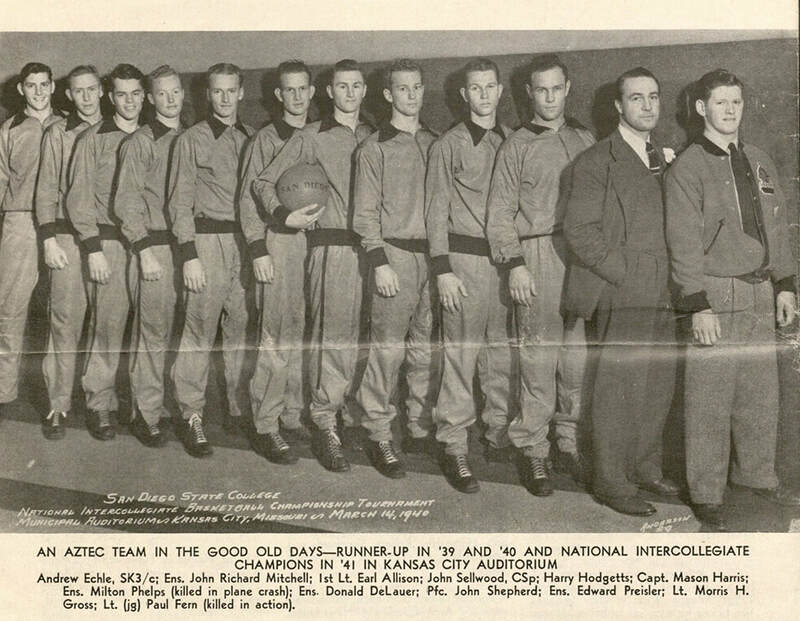 For two years in a row, 1939 and 1940, the San Diego State basketball team took second place, and then in 1941, right before Pearl Harbor, they won the national title. Their trophies hadn’t even collected dust when the teammates went to war. Three members of that championship team lost their lives. Paul Fern was killed in action in the Pacific. …we were getting low on supplies and we got our first supply by air. I have never seen anything so beautiful as those C47 & fighter protection as they came in low circled… and then came back & started their drop of supplies. Those colored chutes as they floated down were beautiful & words can’t describe the feeling… Doc it’s not possible to put on paper what one feels in those instances. Mason went on to fight under General Patton in Germany, where he was killed in action. The team’s star forward, Milton Phelps, nicknamed Milky, was one of the best-loved athletes on campus. After he lost his life in a training crash, the college retired his number, and faculty voted to award him a degree posthumously. A classmate wrote this entreaty to Dr. Post. It still serves as a call to action today. ​You at State can be proud of your sons and daughters, you taught us courage and truth, we will fight to keep you there to teach the ones that will come after us to be better equipped to run this world after this mess is over. You Dr. Post and men like you hold our future, and our children’s future in what you give them now. Make them men, strong men as you have made us, give them visions and thoughts of good government and how to run it, make them conscious of God and his divine Guidance. Make them HARD for theirs will be a hard row to hoe. Turn out men like Milky Phelps, you can do no better.